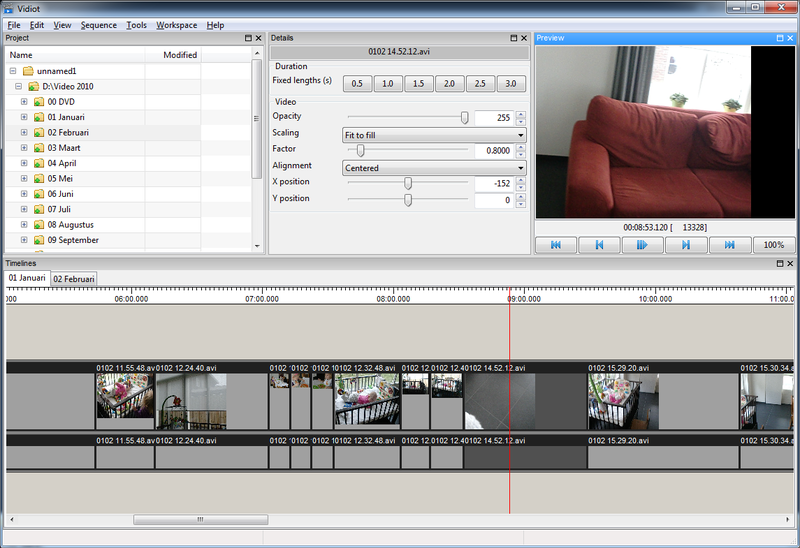 Vidiot is a video editor targeted for plain home video editing. Do they have any relationship with the Foolish IT team? tproli wrote: Do they have any relationship with the Foolish IT team? Vidiot version is currently v0.3.1 (changelog and download at http://sourceforge.net/projects/vidiot/files/). [url]http://sourceforge.net/projects/vidiot/[/url] author wrote: Vidiot is a non-linear video editor targeted for home video editing. It supports operations like compositing, scaling/rotating, adding transitions, trimming, etc. Vidiot version 0.3.5 is available. * Fixed [#243]: Crash when closing multiple Vidiot windows simultaneously. * Fixed [#246]: Automated scrolling during playback only works for a short time. * Added option to enable/disable automatic track creation during drag and drop. * Fixed [#241]: When closing a pane, the view menu is not updated accordingly. * Fixed [#209]: Crash when enlarging unlinked audio clip beyond the file length. * Added keyboard shortcut 'c' for removing empty space under mouse pointer. * Fixed [#206]: [Linux] Move unused video files to recycle bin does not work. * Fixed [#195]: When scrolling vertically the timescale is not redrawn properly. * Fixed [#180]: [Linux] Ctrl-S does not work when the focus is on the timeline. ... includes a Windows 64-bit version. Not sure if there's any performance improvements with that update.